The Public Health Association awarded George Salmond its Public Health Champion award in 2001 for his involvement in public health over more than 40 years. From the outset, George Salmond’s major areas of interest were public health in primary care and in workforce issues. For 20 years he worked in Wellington at the head office of the former Department of Health, initially in health services research and planning, and later as a manager and health administrator. In 1978 Dr Salmond was a member of a three-person delegation to the Conference in Alma Ata where the World Health Organization launched its Primary Health Care Strategy. In 1986 Professor Salmond was appointed Director-General of Health, a position he held for 5 years. In 1993 he was appointed the head of the Health Services Research Centre, a joint initiative of the University of Otago and Victoria University of Wellington, which focussed largely on the inequality of access to health services. The Centre grew in part out of the work he had done during the 1970s in Porirua, focusing on mother and baby services and later on community health development. George was also associated, from its inception in the early 90s, with Healthcare Aotearoa, which was to become one of the prime movers in the advancement of the government’s primary care strategy. He was part of founding the New Zealand College of Community Medicine, which later became the New Zealand component of the Faculty of Public Health in the Australasian College of Physicians. He served the College and later the Faculty in many roles including a period as Vice President of the College and Chair of the New Zealand Committee. Later in his career, Professor Salmond became a trustee of the Hamilton-based Wise Trust, with national reach overseeing a variety of mental disability related services. George chaired the board of the Blueprint Centre for Learning - a private training organisation providing a range of education and training services mainly, but not exclusively, for the mental health sector. He also was a member of the Health Workforce Advisory Committee and chaired its medical reference group. George believed the most important issue to be addressed in the health sector is the development of community health – how to get people to look after themselves. He said the country cannot go on indefinitely underwriting treatments and adding to waiting lists. Far better that people have the knowledge they need and are supported by a sound public health infrastructure to make their own decisions to improve and maintain their health before it gets to the point of needing major medical intervention. Despite filling many different roles in the country’s health sector, perhaps the most telling detail about the man is that he said he felt most happy in one of his earliest roles, in Porirua. His devotion to meetings every Thursday morning at a local café, passionately discussing the current health care issues and the access of lower socioeconomic families to good health care, was an ongoing demonstration of his loyalty and commitment to connecting our sector with its community. We will remember George fondly among our champions of public health and send our sincerest condolences to his wife, Clare Salmond, and family. We are delighted to announce that Dr Prudence Stone has been appointed as the new chief executive of the Public Health Association (PHA). Prudence is no stranger to the PHA having been a very active member of the Wellington branch since 2009 where she is currently co-chair. Prudence has worked in the public health sector for many years and was previously Executive Director of the Smokefree Coalition, where she oversaw the national public health movement that encouraged the government’s commitment to the goal of a Smokefree Aotearoa by 2025. Please read our media statement announcing Prudence's appointment. We are delighted to announce the recipients of the PHA 2018 awards. Mary-Ann McKibben and Keith Reid are this year's recipients. 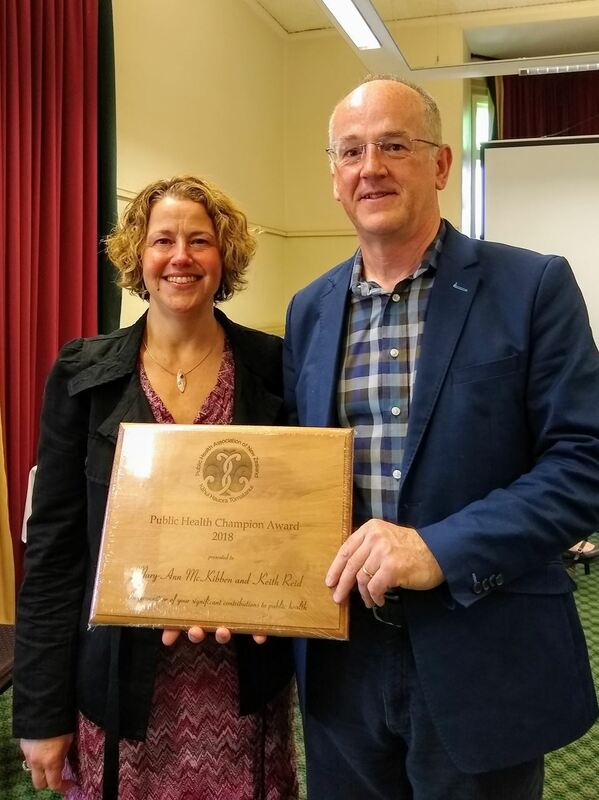 This award is in acknowledgement and recognition of their championing of public health in Dunedin/Ōtepoti over many years & for their valiant and successful efforts to highlight the inappropriateness of the Southern DHB allowing a corporate branded, charity-funded parents’ facility at Dunedin Hospital. Following Mary-Ann and Keith's leadership on this issue Southern DHB was prompted to develop a clear sponsorship policy and there was much greater awareness of the public health perspective among the wider public and the DHB. This year the award goes to Te Mata Rangatira-Hauraki Rangatahi Roopu. This remarkable organisation with the subtitle of Tupuna infused modern Swag is focused on empowering a new generation of rangatahi leaders in the Hauraki area. 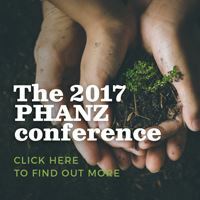 This is a rangatahi led initiative with leaders aged 13 to 18 developing programmes to promote collective wellbeing & development based on Haurakitanga. 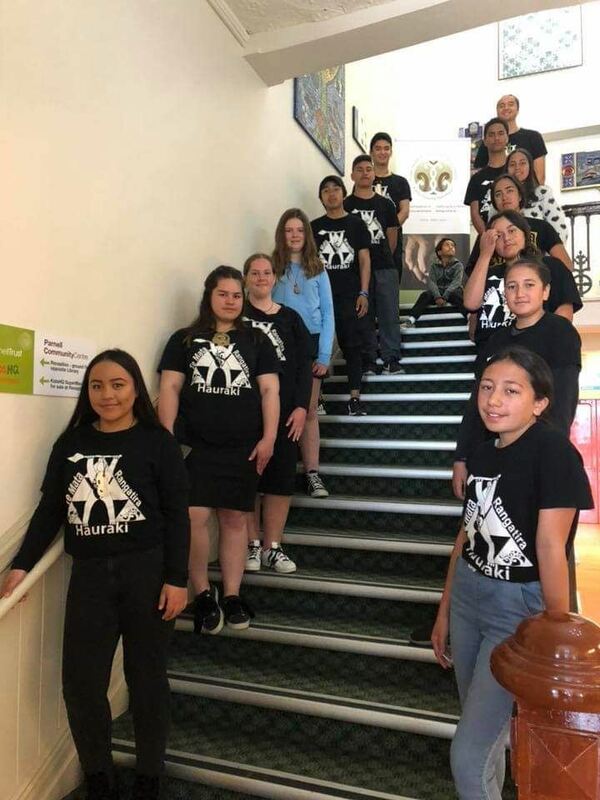 They have led numerous inspiring projects such as Pink Shirt Day, anti-bullying events, Matariki events, Te Wiki o Te Reo Māori, youth summits based on themes such as My Life My Legacy, Be the Change (2017) and Creating a Sustainable Hauraki (2018). The list of all their impressive achievements goes on. Congratulations to our 2018 champions. The PHA's Executive Council has six new members. Its first meeting took place last week (post-AGM) with all newly elected members present. President Lee Tuki, Treasurer Martin Witt and Asian Caucus rep Grace Wong have been joined by several new faces: Allamanda Faatoese as the Pacific Caucus rep, two Māori Caucus reps Janell Dymus-Kurei and David Frost (also Co Vice-President), and elected councillors Ruth Teasdale, Mariam Parwaiz and a familiar face, Emma Rawson, who has been re-elected. We are delighted to welcome the new members and look forward to working with them to achieve our vision of health equity in Aotearoa. We are delighted to announce that PHA members voted at last week's AGM to ratify our policy statement on UVR Protection. This statement was written by Bronwen McNoe and Associate Professor Tony Reeder of the Cancer Society Social and Behavioural Research Unit, University of Otago, Otago. We are very grateful to Bronwen and Tony for volunteering to write this policy statement on what is an extremely significant public health issue. Changes to National Office and Executive Council. There are significant changes happening in both national office and the Executive Council on 11 October 2018. At our Annual General Meeting (AGM) we will farewell our Chief Executive Warren Lindberg and we will also be saying goodbye to a key staff member, Leona Head. The Executive Council wants to assure you that during this transition phase we have made arrangements to ensure as much as possible that it's business as usual. We are committed to supporting the remaining national office staff at this time. With this in mind, please be considerate in your requests and interactions with national office. 10 October, advertising opens for the Chief Executive position. The recruitment will then undergo the usual processes. We will keep you posted and let you know when we have found a successful applicant. We expect the new CE to then start recruiting for the vacancies in National Office to rebuild the team to full capacity in alignment with our strategic direction. Exciting times ahead! The Executive Council recently held elections and the results will be announced at the AGM. We hope to see you at there to join us in thanking Warren for his huge contribution to the PHA. If you have any questions or concerns during this transitional phase, please don’t hesitate to contact me in the first instance, either by email or phone. Click to see the latest 2018-2020 Strategic Direction. OraTaiao welcomes the government’s amendment bill to stop offering new oil permits as a sound decision for NZ’s economy and our health. This bill is a step in the right direction to protect the health and wellbeing of all New Zealanders and meet our Paris obligations. “It’s very clear that almost all the oil, gas and coal we already know about needs to stay in the ground - they can’t be burnt because of the implications for climate change and human health. This makes further exploration foolish,” said Dr Alex Macmillan, Co-convenor of OraTaiao: NZ Climate and Health Council after the introduction of the Crown Minerals (Petroleum) Amendment Bill on Monday. “The recent Regulatory Impact Statement completed by the Ministry of Business, Innovation and Employment makes the mistake of assuming that any reserves which might be found can be commercialised. However, many leading global investors agree that any new reserves will be worthless “stranded assets” - leaving the government and investors with debts, not profits. Neither does MBIE’s statement account for the cost to human health and wellbeing caused by the continuing use of fossil fuels, or our failure to support fossil-fuel dependent communities to make a transition to a low-carbon economies. Continued exploration and extraction means leaving these communities high and dry in a world that is rapidly moving away from fossil fuels. We need to get on track to zero emissions by 2040 in order to avert a health crisis. The next steps include a rapid phase out of existing off- and on-shore exploration and extraction to protect and promote health in our zero-carbon future. The PHA is one of a number of organisations who released a joint statement outlining the benefits of updating the Births, Deaths, Marriages, and Relationships Registration Act (BDMRRA) 1995. Today’s announced changes to the process for amending gender markers on birth certifciates are welcomed by takatāpui, trans and non-binary people.